Who the hell is @DavidJoBrexit (formerly @DavidJo52951945)? 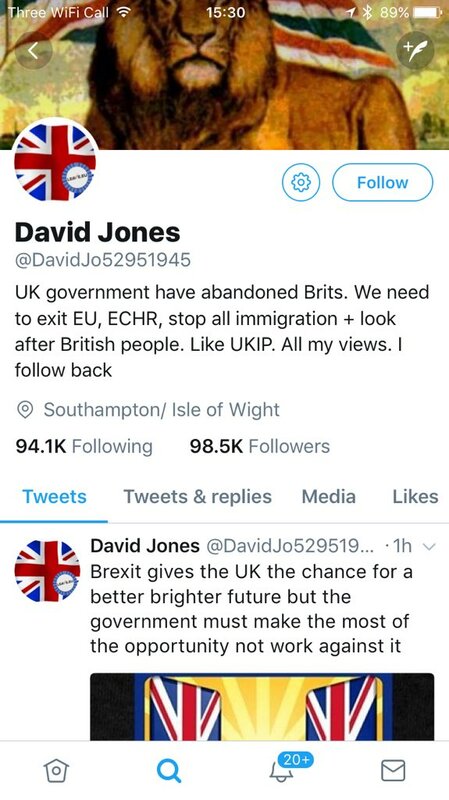 In December 2016 I became curious about an influential pro-Brexit Twitter account called 'David Jones' aka @DavidJo52951945. Although 'DavidJo' claimed a location of 'Southampton/Isle of Wight' my investigations of the account's origins led to the office of a UKIP councillor in Upper Bann, Northern Ireland, called David Jones. I interviewed Mr Jones, who denied any connection, and the mystery of who was behind such a popular account remained. The story of my findings and interview with Mr Jones was published in print only, by the New European, with no further developments until August 2017. Then a threaded Twitter post by @Conspirator0 argued that 'DavidJo' seemed to be a Russian actor. The Times of London picked up the story and ran it under a front page headline Thousands of Twitter users 'deceived by Russian agent'. I was invited onto LBC's James O'Brien show that morning to discuss that story and the wider issues around politically hyper-partisan social media activity. You can listen to that interview below. Meanwhile, the elusive 'DavidJo' has locked its account to private mode, reconfigured its biography and taken a new name 'DavidJoBrexit'. At the time of writing, no one is any the wiser as to who he, she or they are.